← The Project 90 environmental leadership programme lifts off! 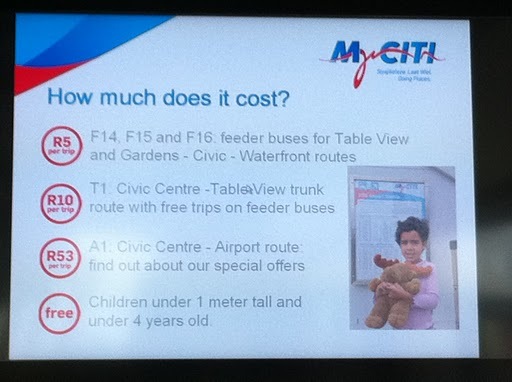 MyCiti runs a shuttle every 20 mins between the Cape Town airport and the civic centre in the centre of town. I’d heard about it, and finally had a chance to try it out. I left the Project 90 offices in Harfield Village just after 9am, and the rain was kind enough to hold off until I had made it to the train station. The metro rail ride to the city centre cost me R7 and took 23 minutes. A five minute walk from the station to the MyCiti BRT (Bus Rapid Transit) station was easy and helped by a friendly porter. The station is located on the waterfront side of the civic centre. The airport shuttle with my fellow passangers ready to go. 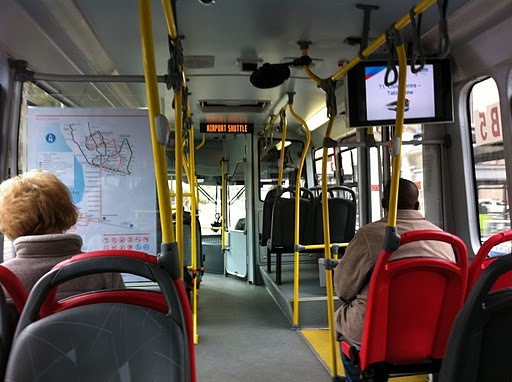 The map on the left is of the MyCiti routes and the TV screen gives updates of the different routes and prices. The one way ticket to the airport cost me R53 (there are monthly tickets available), and an attendant at the station was kind enough to get the bus to wait for me to run on with my bags. 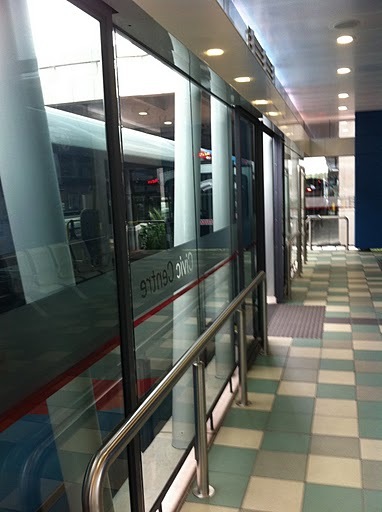 The BRT system means that busses arrive and depart from “stations” and there is no gap or step up between the platform and the bus. I could imagine this is a welcome feature for wheelchair users. There are luggage racks on the busses and the seats are comfortable enough for the 17 minute trip out to the airport. There were only 2 other passengers on the bus out, which makes me wonder about the efficiency of the service. I realise running every 20 minutes gives passengers peace of mind that they will never have to wait more than that time, but I would imagine it would make more sense to run the busses more regularly in the mornings and evenings when the majority of flights depart and arrive. Certainly the passengers on the bus I was on looked like they would have been able to access a bus time table over the internet. There is a great mobile website for Cape Town’s metrorail trains that allows people to search train times by line, station and time (see: http://www.cttrains.mobi). The City of Cape Town is now upgrading the public transport hub around Cape Town station and this will include integrating public transport modes even further, so that commuting to the departure point of the airport shuttle is easier. The changes we like to see solar water heaters on top of RDP houses viewed from inside reliable and safe public transport. If you’re without a lift to the airport, or want to avoid the cost of airport parking, the MyCiti shuttle is reliable and safe option, not to mention the chance to catch up on some last minute reading on the way to the airport. This entry was posted in Sustainable living, Transport and tagged Cape Town, Transport. Bookmark the permalink. My husband used the airport route, too, and it worked well, though trying to find parking to collect him from the city terminus was a challenge. Could be interesting to compare the roll-out and efficacy of the BRT in CT and Joburg. 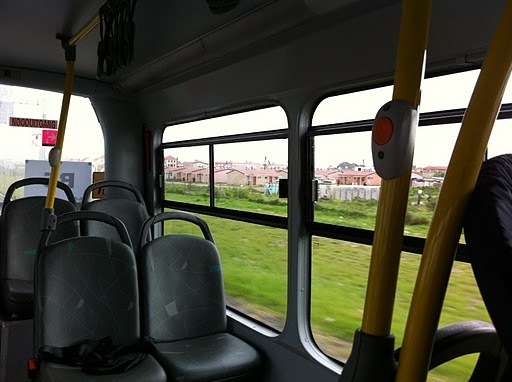 I noticed the MyCiti buses going out to several suburbs; here in Joburg the first ReaVaya route linked Soweto and the inner city, if I remember correctly; more suburban routes are to be rolled out next.